It’s PROM SEASON y’all! This is that time of year when mothers all over the country will go out and purchase dresses for their daughters that cost more than their own wedding gowns, rent tuxes for their sons that cost more than Dad’s and all his Groomsmen combined, and then top it off by spending more money on food, flowers and limousines than was spent on their own wedding in its entirety. 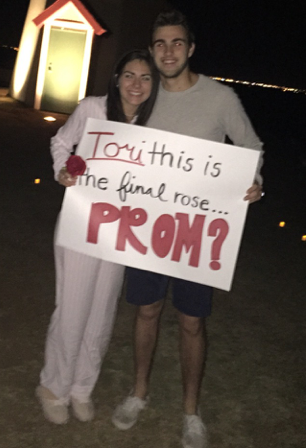 Face it folks, anymore prom is like a little dry-run-practice-wedding you throw for your teen. When I told him, “No way – Not happening,” he seemed almost flummoxed, as if he couldn’t fathom why not. I patiently start to help my boy connect the little dots, leading with the two most obvious deterents, “liability issues” and “property damage.” Waving off my concerns, he assured me that, “Nothing bad is going to happen!” Ahhh… the optimism of youth (and of people who’ve never actually owned anything). When I informed him that we simply couldn’t afford the risk, he countered with, “Why do you and Dad always go straight to, “worst case scenario?” I don’t really have an answer for that. I guess we are the Landed Gentry around here and we don’t much trust The Peasantry. James enlisted the help of several close friends who collaborated with him on an elaborate scavenger hunt. 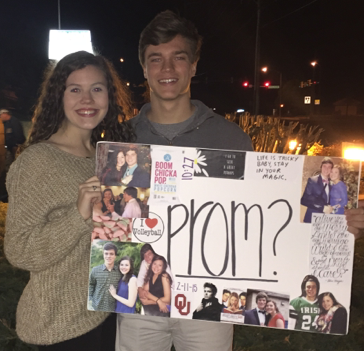 It started with a clue in his girlfriend’s room and after several more clever clues placed at key locations throughout Edmond, it culminated with him standing in the drive-through window at Braum’s holding a glittered sign that said, “Will You Go To Prom With Me?” It was just adorable – as if anyone could say no to him. 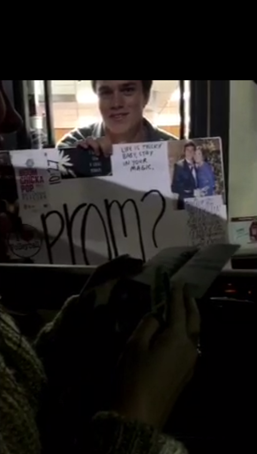 I’ll have a milkshake and a prom date!